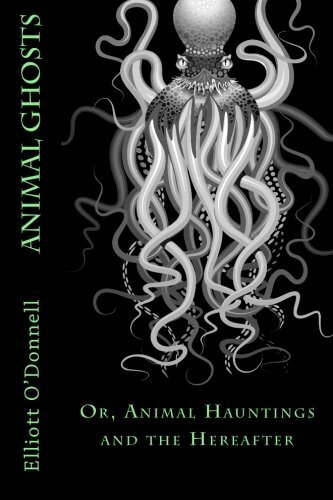 One hundred years ago, Elliott O'Donnell set before the masses a collection of tales which would seem to show that the afterlife is not only populated by the animals that refer to themselves as "human," but by all living creatures. This book, even in our modern era, is as pertinent and insightful as it was a century ago. CHAPTER VIII A BRIEF RETROSPECT There is a surprising amount of credible evidence that animals have spirits that survive death. Animal Ghosts is a mesmerizing collection of strange ghost stories in which the antagonists are various animals, family pets or otherwise. Divided up into chapters of ghost sightings by each group of animals, you will hear of spectral haunting by dogs, cats, birds, jungle animals, etc. Do animals sometimes come back as ghosts just like some people do? The evidence points to the answer: yes! Many people have had experiences with family pets coming back whether that be as simple as a ball of twine rolling across the floor by itself with no outside source, the feeling of something rubbing up against your leg and there's nothing there and sometimes the actual visual apparition of the beloved pet. It seems that the ones that are reported the most in the animal world are dogs, cats and horses in that order respectively. However, there seems to be some confusion. Can ALL animals appear or come back as spirits? Are there certain limitations to which ones are allowed? Accounts of animal ghosts have existed for a very long time. Sometimes during travel, ghosts of animals have been reported by passers by, such as the account of a ghostly canine that snarls at travelers on certain roads, for example. However, most animal ghosts seem to be witnessed after recently passing, still visiting their beloved human companions. There are ghost stories about various types of pet animals, especially cats, dogs, and horses being seen after their death. Animal ghosts seem to visit where they formerly lived, and may stay for a minimal period of time or longer. Many owners have reported not only seeing their ghost animal, but also smelling, hearing and even feeling them through touch. Due to traditional religious teachings that instruct that only humans have souls, many are unaware that animals have spirits just like human beings and can interact and even be seen as animal ghosts. Pet ghosts seem to be the most common animal ghosts seen, and this could be because of the strong bonds and emotional ties that were created. "Animal Ghosts, or Animal Hauntings and the Hereafter" remains the perennial classic on this fascinating subject. Elliott O'Donnell (February 27, 1872 - May 8, 1965) was an Irish author known primarily for his books about ghosts. He claimed to have seen a ghost, described as an elemental figured covered with spots, when he was five years old. He also claimed to have been strangled by a mysterious phantom in Dublin. He claimed descent from Irish chieftains of ancient times, including Niall of the Nine Hostages (the King Arthur of Irish folklore)  and Red Hugh, who fought the English in the sixteenth century. O'Donnell was educated at Clifton College in Bristol, England, and later at Queen's Service Academy, Dublin, Ireland. In later life he became a ghost hunter, but first he traveled in America, working on a range in Oregon and becoming a policeman during the Chicago Railway Strike of 1894. Returning to England, he worked as a schoolmaster and trained for the theater. He served in the British army in World War I, and later acted on stage and in movies.